I was very impressed with Paula Deen’s Chili in a Biscuit Bowl recipe when I first saw it on her show. They look so good and easy, that I made them for the Superbowl Party we had at our place with a few friends. Since we don’t eat beef, I made a spicy three bean chili to fill in the biscuit ‘bowls’. Invert the muffin tray and spray with cooking spray, set aside. Remove biscuits from container and lay on a lightly floured surface. Roll each biscuit into a 4 inch circle. If your circle is uneven, don’t worry about it. Place a biscuit circle over the back of each muffin cup.Press around the cup to form a bowl shape. Bake for 10 to 12 minutes, until lightly browned. Let cool slightly. Remove the biscuit bowls and set aside. Heat the olive oil in a pan. Add onions and saute until they are translucent, about 5-6 minutes. Add the garlic, jalapeño, oregano, cumin powder, and chili powders. Cook stirring for 3 minutes. Add the tomato sauce, water, black beans, pinto beans, kidney beans, and corn. Bring to a simmer, reduce heat to low, and cook for 20 minutes. After 20 minutes, take a potato masher, or spatula, and mash some of the beans against the bottom of the pot. This will thicken the chili. The more you mash the thicker it will become as it cooks. For a medium-thick texture mash about 1/4 of the beans (you can always mash more later). Stir well and simmer for another 10 minutes. While its still warm, spoon into the biscuit bowls. Garnish with shredded cheese, sour cream (optional) and chopped scallions. Serve immediately. These were a super hit at the party. The chili was perfectly seasoned, spicy enough to warm us up in this winter. cute and tempting ones Namratha..
Wow such a great idea for party! can you use puff pastry also to make this biscuits? Wow they looks so cute and delicious. What a great idea and they look delicious! Wow that is a feast for eyes and I am sure for the tummy as well.. Cool pictures as well Namratha! These bowls looks so crisp and cute... Yummm, the chili... Makes a nice treat.. Very cute display, like the idea of using biscuits for bowls. Wowwww superb!! sakkatagidhe nododakke .. WOW!!! Just superb..tks for bringing it across to us! Very cute looking biscuit bowls. Nice vegetarian recipe. YUM! 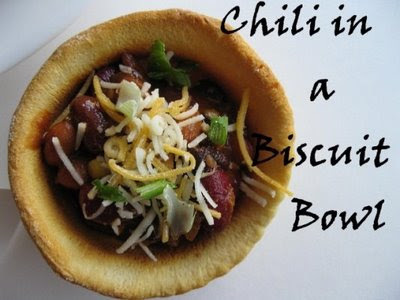 Chilli in a biscuit bowl is a fabulous idea... looks cute.. no wonder this was a hit. That's a great idea and the bowls look so cute. I love Paula Deen. She is so charming and can light up the room with her presence.